Guandao, acluewithout, conorbebe and 4 others like this. 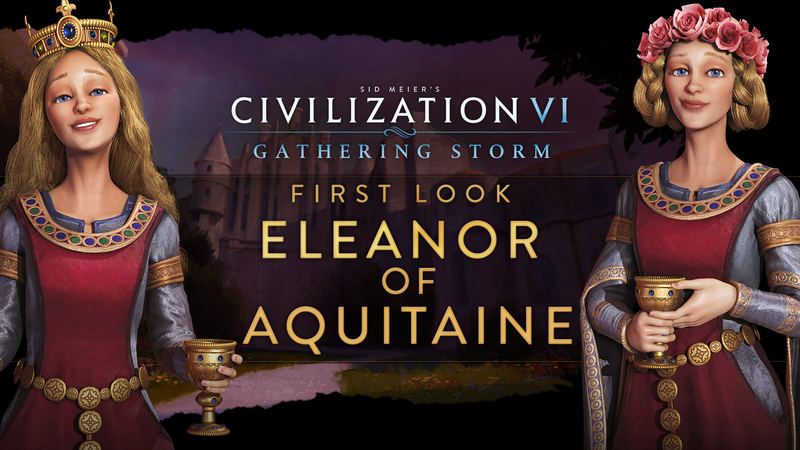 Wait, the final leader is Eleanor?!? I'm SHOCKED. TheMarshmallowBear, Karmah, Guandao and 17 others like this. For the first time in Civilization franchise history, we have a leader able to lead two different civilizations! Great Works in Eleanor’s cities each cause a loss of Loyalty per turn in nearby foreign cities. A city that leaves another civilization due to a loss of Loyalty and is currently receiving the most Loyalty per turn from Eleanor skips the Free City step and instantly joins her civilization. Guandao, bonafide11, Jkchart and 10 others like this. She looks like a Disney princess. LoganInCamo, Guandao, Pietato and 9 others like this. That is one strong ability! WorldWarIV, Kmart_Elvis, Kjimmet and 6 others like this. I love her ability though. Icicle, Kjimmet, Hawke9 and 4 others like this. I love the animations. I also love that her ability is the same for France and England. I predict the livestream will talk a ton about modding. I hope someone can mod some of the current leaders to play multiple civs. Ivan Hunger, WorldWarIV, Kjimmet and 8 others like this. They said "how will you rule". They missed the chance to say "who will you rule". Banazir864, ChocolateShake, kingofsealand and 22 others like this. ChocolateShake, Prima Italia and CivLuvah like this. I definitely like her better than Catherine for a French cultural victory. For England I'll have to test her, but I wonder if she can help "colonize" other cities on continents different from your capital's. Caprikel, Icicle, Hawke9 and 1 other person like this. Though her ability to exert more loyalty on nearby cities with more Great Works is a nice mechanic. Buthera, Aussie_Lurker, AntoineS and 4 others like this. Arent11 and nzcamel like this. LoganInCamo, borad, Nigel_Tufnel2 and 16 others like this. Oh wow! That is one cool LUA and bar the name definitely not what I expected. And I love both her looks. I'm really digging this one! LoganInCamo, Caprikel, ChocolateShake and 12 others like this. craney1987, King Rad, KyivanRusCivPlease and 26 others like this. ChocolateShake, Icicle, RohirrimElf and 2 others like this. That's a big "meh" from me in terms of her ability, unless they've drastically changed the loyalty mechanism (especially compared to Victoria and Catherine). The leaders models look good, though. Interesting, though more synergy with France than England.